Mdina is the old capital of Malta, a medieval walled town situated on a hill in the centre of the island with views off to the Mediterranean. The Apostle St. Paul resided in the city after his historical shipwreck on the islands. Outside the walled area is the nearby is the town of Rabat, which has some Roman and historic sites and churches. The town of Mdina is small, and can be wandered on foot or toured in a horse and carriage. A map and walking tour can be obtained from the tourist information office just inside the main gate. St. Paul's Cathedral is located on the site where St. Paul, who was shipwrecked on the island, converted the Roman governor of the island to Christianity. Publius became the first Bishop of Malta, and Malta one of the first Christian countries in the world. Publius was later sainted and become Malta's first saint. The church was built over many periods, with some parts dating back to 1090 AD, and enlarged in 1490. Palazzo Santa Sophia, dating back to 1233. Rabat, nearby, has a Roman town house which contains a Museum of Roman Antiques, St. Paul's church and Grotto, and the catacombs of St Agatha and St Paul, where burials took place dating back to the 4th century. It is easiest to get around on foot. A tourist map can be obtained free of charge from the tourist information centre just inside the Mdina gate. Internet cafés and Wi-Fi zones are quite abundant with connection rates peaking at 30Mbit/s. More and more small, independent cafes and restaurants are providing free WiFi hotspots. The international telephone code for Malta is 356. Emergency number is 112 for all services. The country has three mobile phone networks available: Vodafone, Go Mobile, and Melita Mobile. Due to international agreements with providers across the globe, Vodafone, GO and Melita are sure to be apart of your carriers roaming plan. To avoid high costs, buy a local SIM-card. Malta Post is the national postal service with generally cheap and reliable services, albeit not very fast. All post offices are open from around 8:00am till noon, some opening slightly earlier or closing later. The main offices stay open until around 4:00pm. For sending international packages, you might consider companies like DHL, TNT or UPS. 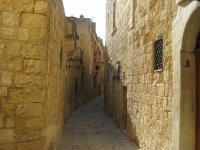 We have a comprehensive list of accommodation in Mdina searchable right here on Travellerspoint. You can use our map to quickly compare budget, mid-range or top of the range accommodation in Mdina and areas nearby. This is version 6. Last edited at 13:03 on Dec 23, 13 by Utrecht. 1 article links to this page.